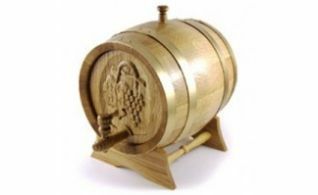 There are a variety of Hungarian oak barrels that Musca Wine Pressing & Supplies offers. The barrels come in different styles, colours and sizes. Hungarian Oak Barrel 1.5 Lt.
1.5 Lt. DPB round shape oak barrel. Dispensing barrel that comes with stand, tap and wooden stopper. Hungarian Oak Barrel 10 Lt.
10 Lt. AGB oak barrel. Toasted oak barrel comes with stand and wooden stopper. Hungarian Oak Barrel 110 Lt.
110 Lt. AGB oak barrel. Toasted oak barrel comes with stand and wooden stopper. Hungarian Oak Barrel 2 Lt.
2 Lt. DPB oval shape oak barrel. Dispensing barrel that comes with stand, tap and wooden stopper. Hungarian Oak Barrel 225 Lt.
225 Lt. AGB oak barrel. Toasted oak barrel comes with stand and wooden stopper. Hungarian Oak Barrel 23 Lt.
23 Lt. AGB oak barrel. Toasted oak barrel comes with stand and wooden stopper. Hungarian Oak Barrel 3 Lt.
3 Lt. DPB oval shape oak barrel. Dispensing barrel that comes with stand, tap and wooden stopper. Hungarian Oak Barrel 46 Lt.
46 Lt. AGB oak barrel. Toasted oak barrel comes with stand and wooden stopper. 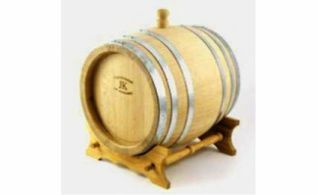 Hungarian Oak Barrel 5 Lt.
5 Lt. DPB round shape oak barrel. 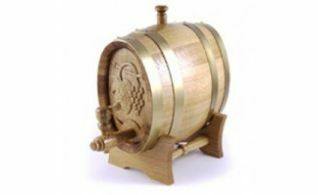 Dispensing barrel that comes with stand, tap and wooden stopper. Hungarian Oak Barrel 60 Lt.
60 Lt. AGB oak barrel. Toasted oak barrel comes with stand and wooden stopper.